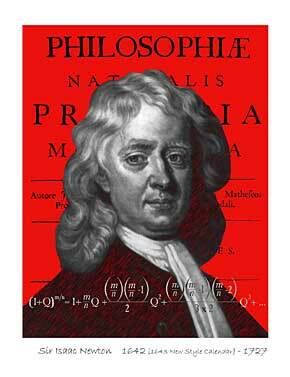 Everyone thinks Isaac Newton was so great and so smart and that he came up with the three laws of motion on his own. Not so. What all the scientists don’t want you to know is that Newton stole the ideas from his own wife. It was Mrs. Newton who first penned the laws of toddler motion after a long hot summer with a two-year-old and Newton later adapted them for his little science project. Objects in motion tend to stay in motion, and objects at rest tend to stay at rest unless an outside force acts upon them. A toddler in motion tends to stay in motion, especially under the influence of Oreos. Toddlers will not rest unless an outside force acts upon them. The rate of change of the momentum of a body is directly proportional to the net force acting on it, and the direction of the change in momentum takes place in the direction of the net force. The rate of change to the momentum of a todder is directly proportional the force of his mother’s hand acting upon his behind. That is if she is fast enough to catch him. The direction of a toddler in motion will change opposite to the location of the mother. To every action a mother proposes, a toddler will respond with an equal and opposite reaction until the mother has pulled out every last tuft of her own gray hair and collapsed in a sobbing heap upon the floor cradling a bottle of tequila. Great gag and all, but… does the caretaker of children just plain *have* to be a woman? Think about it… as long as we’re going to have fun messing around with history, why does it take a fictional Mrs. Newton to spend enough time around toddlers to learn their secrets, when Isaac himself (with a few modifications to his personality) is good enough for the job? Another great post! I can realte to every one of these. I can’t wait till you tackle Einstein’s theory of relativity! Well Mr. Truevyne would be wrong. Oreos were invented by the famous anstronomer Galiloreo, hence the name. He got the idea while studying the Milky Way which made him very hungry. Another fact the so-called scientists don’t want you to know. I read this blog entry to my VERY smart husband. He says he’s not convinced your research is all that scientific since oreos were not invented yet. You are a scientific mastermind. And I love the picture of you below. You do such a good job hiding the pain. ROFL, how true is that? you, my dear, are brilliant! hehe…you are too funny! And this was definitely NOT covered in the two years of physics I took in college. I think you’re onto something there. Maybe you should start researching all the great scientists in history! Antique Mommy, I do apologize. I just received a call from my brother that I commented on the wrong comment, Yikes! I can assure you that my sister needed no help in physics or any other subject for that matter…her sister, on the other hand on the other hand, could have used a little blog Ed 101 before posting on YOUR site! My science teacher husband enjoyed your take on Newton’s Laws. . .:) As did I.
I second my sister’s notions!!! You are amazing and I feel somewhat silly posting a comment on your blog…but it’s my birthday, so what the heck! “You really should be published.”!!! So funny and true! How do you come up with this stuff?! You really should be published. Mrs. Newton had it soooo right! My problem is that the force of my hand on the behind changes nothing about the motion of the toddler, except adding toddler giggles and/or shrieks of laughter to the motion. It’s that “this hurts me more than it hurts you” thing that I swore I’d never think or say. That is sooo funny!!! I even read it out loud to my hubby, we were both laughing.